A men-versus-shark thriller and the original modern high-budget, high-publicity summer blockbuster film, Jaws is a wild ride straight into the razor-sharp teeth of entertainment. Director Steven Spielberg's first massive hit is a gripping, suspense-filled battle between one small community and one mammoth killing machine. At the New England summer resort town of Amity Island, a giant white shark starts a reign of terror. A skinny-dipping woman is the first to be killed, followed by the young Alex Kintner. Police Chief Brody (Roy Scheider), who has just moved to the community with his wife Ellen (Lorraine Gary) and young son, is afraid of the water and wants the beaches closed to safeguard the public from further attacks. But with the July 4th weekend fast approaching and the town's economic viability at stake, the town's Mayor Vaughn (Murray Hamilton) would hear none of it, especially when a large tiger shark is jubilantly caught and the threat hastily proclaimed to be over. When the great white makes an audacious attack against Brody's young son and his friends in a supposedly sheltered inner pool, Brody teams up with grizzled shark hunter Quint (Robert Shaw) and marine biologist Hooper (Richard Dreyfus), and they head out in Quint's boat to hunt down the predator on the open water. With tension mounting between the gruff Quint and the college-educated Hooper, they soon make contact with the seemingly indestructible and incredibly powerful shark, and the determined hunters become susceptible prey. Drawing on eternal themes of man versus monster and the need to confront existential fears in order to survive, Jaws is a simple story of a large shark terrorizing a small community. But the movie adaptation of the Peter Benchley novel started shooting without a script, with an inexperienced director, and with a mechanical shark that rarely functioned. Over budget and way over schedule, producers Richard Zanuck and David Brown demonstrated remarkable faith in a 28-year-old Spielberg, and through talent and serendipity, he delivered a classic. 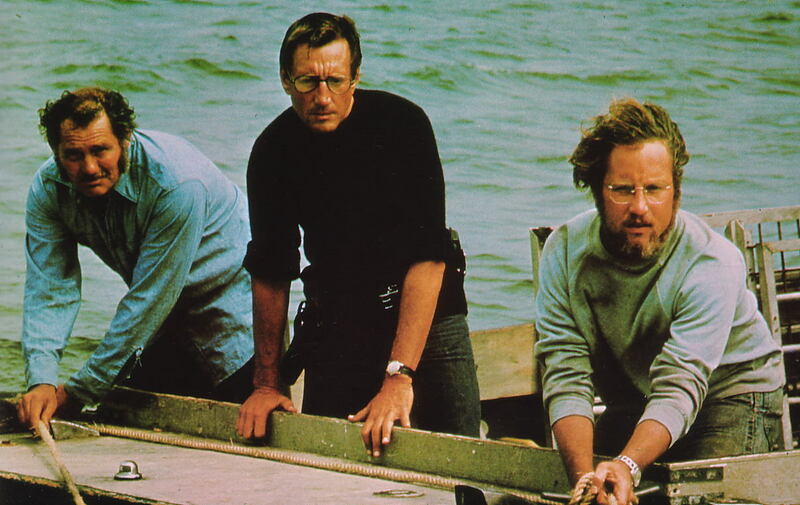 Jaws went on to become the highest grossing film in history (until Star Wars came along). The malfunctioning mechanical shark meant that Spielberg had to suggest the presence of the beast much more than show it. Jaws was therefore transformed from a horror film to a suspense thriller, the lethal predator lurking but unseen, its presence mostly suggested through point-of-view shots, and confirmed with the agony of churning water turning red with the gushing blood of mangled victims. The imagination always creates the most powerful of visions, and the shark became the most menacing threat that every viewer could individually imagine. 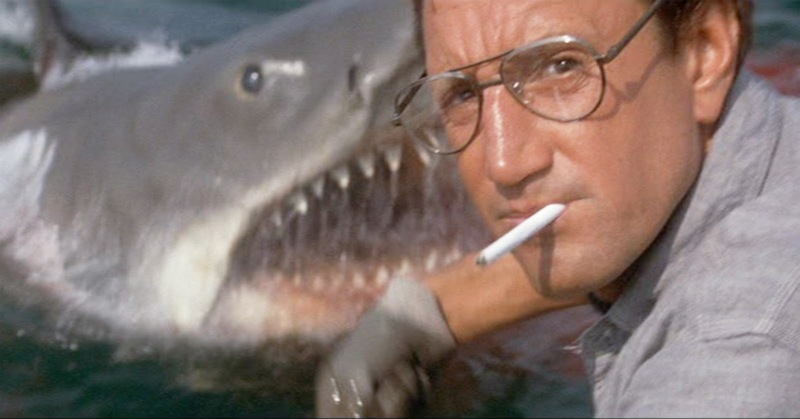 When the shark finally does appear it causes a jolt, never more so than the startling over-Brody's-shoulder shot, leading to the classic and prophetic "You're gonna need a bigger boat" line, ad-libbed by Scheider to Shaw. The brilliantly minimalistic soundtrack by John Williams became as much a part of the film as the shark itself. Built on an astonishingly simple but incredibly sinister tuba two tone, the chilling music ignited Williams' career and started and long-lasting association with Spielberg. Among the actors, Robert Shaw makes the strongest impression. Enjoying Quint as a larger than life and naturally abrasive hunter, Shaw lets loose with the dry laugh, the bad jokes, the long stories and the abuse directed mostly at Hooper. But he also gets the most deadly serious monologue in the film, recounting his background as a crew member of the USS Indianapolis, torpedoed by the Japanese at the end of World War Two with the survivors mercilessly attacked by sharks as they awaited rescue. It's a riveting island of quiet personal terror in the wide open seas of Jaws. Roy Scheider plays Brody as a stoic man trying to do what is right, an outsider to the community objectively assessing the risks much to the consternation of the locals. He is finally forced to confront his fear of the water, although how a man with water phobia ever landed the position as Chief of Police at a seaside resort remains to be explained. 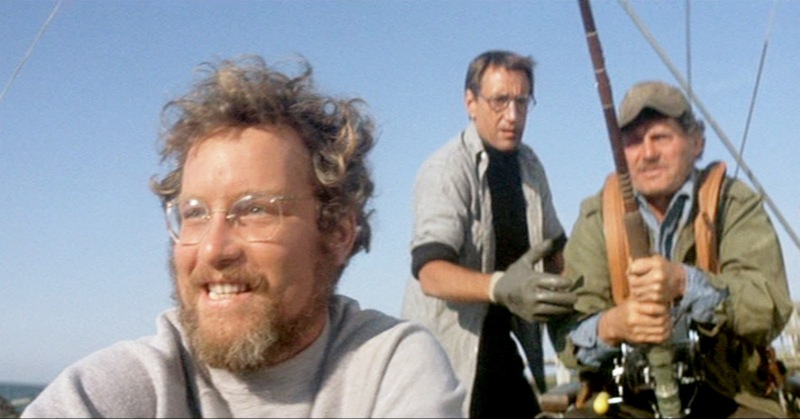 Dreyfuss is slightly annoying as the academic shark expert Hooper, a know-it-all almost deserving of the abuse dished out by Quint. Murray Hamilton brings delicious smarminess to Mayor Vaughn, and he gets the second best line of the movie when confronting the idea that the dead tiger shark may not be the killer terrorizing his community: "This is not the time or the place to perform some kind of half-assed autopsy on a fish. And I'm not going to stand here and see that thing cut open and have that little Kintner boy spill out all over the dock." Jaws delivers extraordinary suspense in the water, an unforgettable story of evil lurking beneath the surface, a killing machine operating with beady-eyed efficiency.